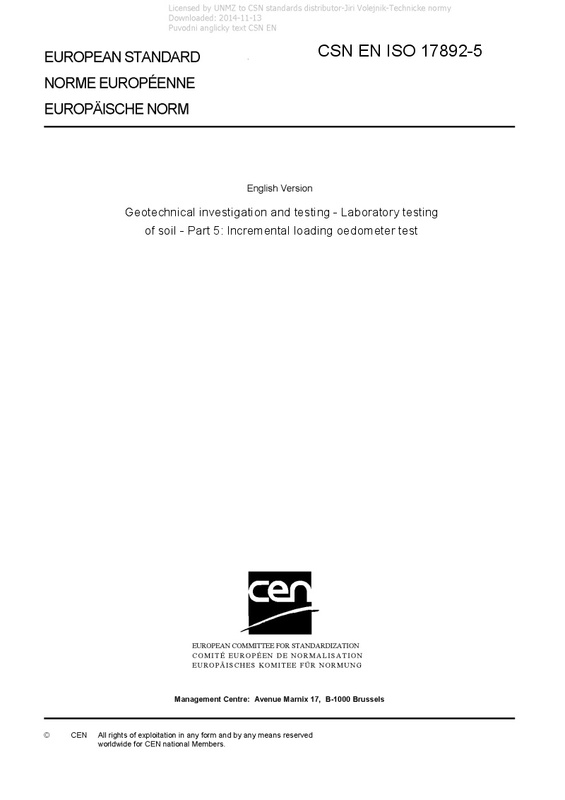 EN ISO 17892-5 Geotechnical investigation and testing - Laboratory testing of soil - Part 5: Incremental loading oedometer test - ISO 17892-5:2017 specifies methods for the determination of the compressibility characteristics of soils by incremental loading in an oedometer. ISO 17892-5:2017 is applicable to the laboratory determination of the compression and deformation characteristics of soil within the scope of geotechnical investigations. The oedometer test is carried out on a cylindrical test specimen that is confined laterally by a rigid ring. The specimen is subjected to discrete increments of vertical axial loading or unloading and is allowed to drain axially from the top and bottom surfaces. Tests may be carried out on undisturbed, remoulded, recompacted or reconstituted specimens. The stress paths and drainage conditions in foundations are generally three dimensional and differences can occur in the calculated values of both the magnitude and the rate of settlement. The small size of the specimen generally does not adequately represent the fabric features present in natural soils. Analysis of consolidation tests is generally based on the assumption that the soil is saturated. In case of unsaturated soils, some of the derived parameters may not be appropriate NOTE This document fulfils the requirements of the determination of the compressibility characteristics of soils in the oedometer for geotechnical investigation and testing in accordance with EN 1997?1 and EN 1997?2.